On Wednesday night (23 November, 2018) I attended a great event organised by the University of Southampton at Southampton General Hospital, ‘Fake Food!’ Question Time. 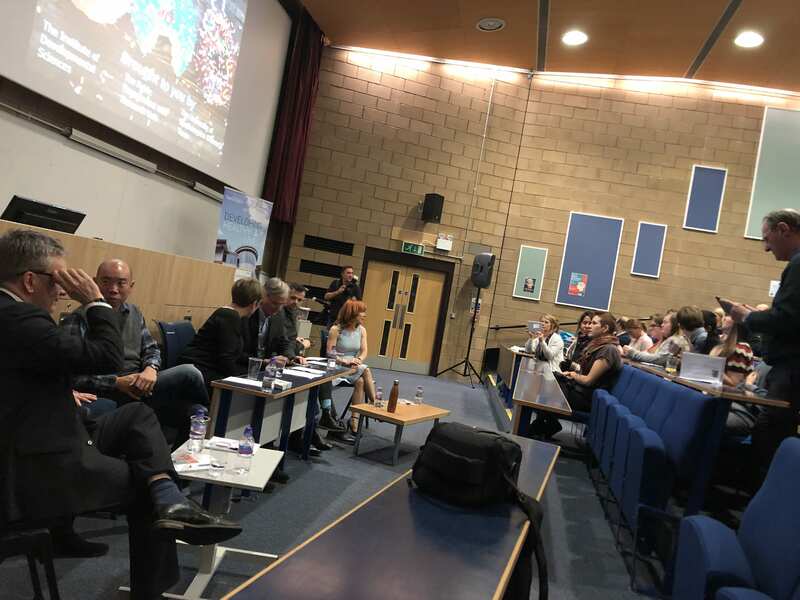 The idea was to bring together a collection of experts on various aspects of food and health and invite groups of local Sixth Formers to grill them in the style of the familiar Question Time format. The event is part of a large ongoing project in Southampton to look at the effects of food on all stages of our lives. The concept was great, and very well executed. Monitoring Twitter hashtag #barf enables FSA to spot outbreaks of Norovirus and other illness incidents. This can lead to insights significantly earlier than formal disease monitoring channels. There was a discussion about how communicating food health matters to young people was effective as they then talk to their parents and grandparents as they genuinely care about their health. We heard how various projects related to growing food cause young people to engage with food, eat new things (tomatoes) and reappraise their food choices. We heard from Nathan who, as a head teacher, had set up a market stall at his school gate – not so much to distribute food, but rather to use food as a medium of communication. There was a really good question on whether hospitals should judge people who are not taking advice on healthy eating? Not really possible, there are all sorts of reasons such as psychological trauma or antidepressants that can affect weight for example. There is also a difference of context between elective surgery where patients who have not prepared would not see any significant benefit from the procedure, and emergency operations which are undertaken non-judgementally. We need to harness our collective intellect to address this challenge. So encouraging more people to eat less meat is more impactful than persuading a few to become vegans. Although such a political response doesn’t necessarily answer the question. Another pragmatic response to this question was that “you can look through a lens to find an answer that you want.” Eg. it depends whether the animals are on land that could otherwise be used to grow crops that we could eat or on otherwise un-farmable land. Often girls who weren’t eating a lot of red meat in the first place- and end up becoming anaemic. A vegan student commented – “people are trying to get money out me.” There was a discussion around the idea that people have to learn that the system does not exist to help or look after people, people have to learn to make decisions to look after themselves. Although this could include fighting back against the system. We were reminded that two portions of fish a week are recommended, and that one of these should be oily fish. A quick show of hands indicated that a reasonable percentage of attendees claimed to follow this advice. It was agreed that there is much focus on body image – especially when talking about food. Orthorexia (the term for a condition that includes symptoms of obsessive behaviour in pursuit of a healthy diet) was discussed. Clean eating, fortunately, is now debunked. Orthorexia refers to an unhealthy obsession with eating “pure” food. At a population level we need to loose weight, but we are all different. Everyone has a different ability to carry weight. Older people are loosing weight, but also nutrition. Size has different connotations in different parts of the world. GP are obsessed with measuring things – but athlete Lynford Christie was technically obese in terms of his body weight. The panel were asked where to look for information: Patient.info (GPs for GPs), Food.Gov.uk, public health England were suggested. Popular tabloid newspapers are best avoided. The final question was great, to each of the panel members – what was the last thing you ate? To be fair to the panellists, most of them had done some heavy travelling to be with us, and many had a long journey home to follow. Overall, some fascinating and relevant insight for the Internet of Food Things Network Plus. There are huge issues surrounding food consumption and health, and the ways of addressing these issues are also complex. Data has the potential to play a part in this, especially when combined with behavioural insight and other approaches to understanding and communicating with data. This entry was posted in Uncategorized on November 23, 2018 by Steve Brewer.